← Roman Coins: sources of economic history, mediums for art work and portraiture, platforms for political thought, stages for religious culture and for buying your bread with. All this from one little object….. The third blog from Shropshire’s Heritage Heroes is showcasing a fantastic little book from 1696. Ann Whittle’s Recipe book, as it is affectionately known, is a voyage account book, exercise book and remedy and recipe book. It is highly likely that there is more than one author in this little book, as the handwriting differs, but the only one to place their name in it was Ann Whittle, hence it is named after her. All the Heritage Heroes team agreed that we had to get this book onto the website for our virtual volunteers to read and transcribe. It is finally ready and available to transcribe as a project on the website, but as with all the projects on and coming up onto the website, it was a long journey to get there. The Ann Whittle recipe book is a prime example of the lengths that the team go to, to get interesting and important projects ready for working on in the comfort of your own home. The book was only accessioned, so firstly it needed to be catalogued, it then had to be digitised from front cover to back cover, the images then needed to be catalogued. The images and the books records then needed to be imported to the website and from there the team has the task of creating a project for you, our virtual volunteers. Once the book has been transcribed and checked, it is then exported, formatted and then re-imported back into the database where it came from with the new edits you all have worked so hard on; making for one long but very worthwhile and important process. The team has affectionately named it the ‘Three Step Process’! Ann Whittle’s book was one of the first items that the Shropshire’s Heritage Heroes team was asked to put up onto the website for volunteers to transcribe from. As such it has a special place in the team’s hearts. I remember going to find it for the first time, I often think to myself that I feel a little bit like an archive equivalent to Indiana Jones, when I have to go searching for something down deep in the archive stores, minus the hat, whip and imminent danger of course! After finding where it had been neatly catalogued away I was confronted with a jewel of a book, small and perfectly formed, my heart and mind racing as to what I would find inside. Opening the book for the first time I was wowed by the beautiful calligraphy, the doodles and the fascinating recipes and remedies. One of my favourites that sticks in my mind has to be ‘The Golden Cordial’, which contains a rather large amount of French brandy, some sugar, cloves and saffron. After reading through the book, we each decided to try to make a recipe and show you all the outcome. As you can see some were more successful than others! I could not even bring myself to put up the cake that I had made! Disaster was not even close. However Alison decided to make Portland Cake. Here is a picture of her with her finished product! It was very very delicious! If you, our virtual volunteers, would like to help transcribe the Ann Whittle Recipe and Remedy book then there are still a few pages left to do. Once they are gone they are gone. The project can be found at Ann Whittle Recipe and Remedy book. 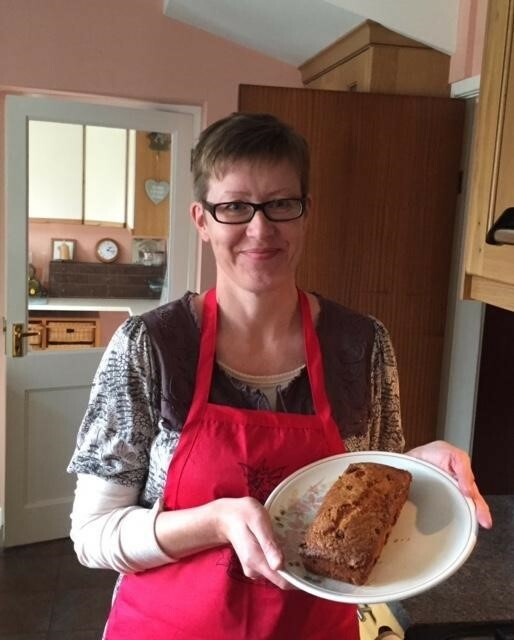 If you, our virtual volunteers, would like to have a go at making one of the recipes in the book too, it would be lovely for you to post a photograph of your finished product and a very brief story of how much fun it was or if you had some trouble on either our twitter wall for everyone to see, (https://twitter.com/VirtualVols) or adding your picture to Shropshire’s Heritage Heroes community page and share with all the other virtual volunteers!